Featherpunk Prime from Super Hatch Games is a twin-stick platformer starring an acrobatic robot flamingo on a mission to ascend a tower and take down an arms manufacturer known as the Cybirdroid Corporation. 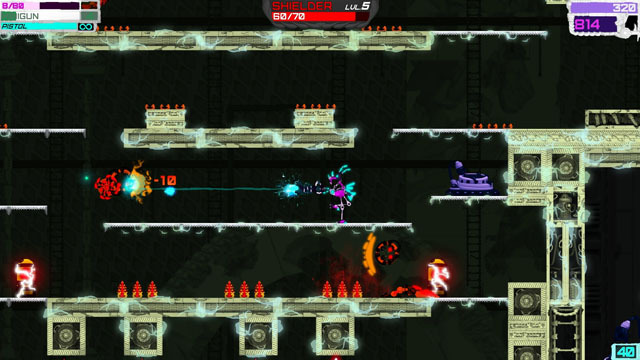 The seemingly ungainly creature is able to wall slide, rail grind, and air dash his way through environments while dodging bullets and laying down heavy fire against enemies and bosses. Weaponry includes bullet-spewing miniguns, precision crossbows, deployable turrets, and energy swords, among others, and the player is able to upgrade his firepower by grabbing loot from downed enemies. The player can also gain additional support from F-Droid, a flying support bot that follows you around and lays down additional firepower. Featherpunk Prime is now available for PC via Steam and releasing this month on the Humble Store. Check our coverage here.